Protecting the dignity and rights of individuals is intrinsic to the church’s mission. 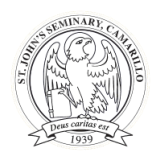 St. John’s Seminary has a responsibility to foster a climate of fairness and cooperation. Situations may arise, however, when seminarians feel that they have been unfairly treated. In this circumstance, the seminary encourages seminarians to use informal means to bring about reconciliation. When informal means do not suffice, recourse should be had to established administrative procedures. Should these prove inadequate, seminarians may have recourse to the grievance process described below. The purpose of the process is to secure a just and speedy resolution, in an atmosphere of mutual understanding and Christian charity, to a seminarian’s grievance. Grievances may concern personal behavior such as repeated harassment, disruptive conduct, or noise in private areas. Grievances may also concern the failure of the seminary or member of the seminary community to provide services adequately or fairly: for example, in areas of seminary meals, living facilities, academic courses, or academic grades. However, as noted below, the seminary promotes resolution of issues through personal and ordinary administrative channels before the grievance process is used. An exception to the seminarian’s right to claim a grievance and appeal for its resolution is the annual student review and promotion towards ordination. The annual review is the responsibility of the Rector in consultation with the faculty and may not be appealed. The Director of Students acts as the Grievance Officer to whom seminarians may appeal when they have a grievance. If the grievance should happen to involve the Grievance Officer, then the Director of Human Formation will act as the Grievance Officer. The seminary promotes the resolution of grievance through ordinary means and personal interaction before the grievance procedure is invoked. For this reason, a seminarian with a grievance is expected to seek resolution of the grievance first through informal means and then through normal administrative means when these are provided by the seminary. If the procedures already established in official seminary policy do not suffice for settling the grievance, then the grievance process may be used. The first step in the process is for the seminarian to make a written report of the grievance to the Grievance Officer. Within one calendar year of the alleged grievance, the aggrieved seminarian shall make a report stating the nature and source of the grievance and the remedy desired. If the Grievance Officer believes the grievance is substantive, then he or she will notify the Rector. is appointed by the Rector from a list of three community members named by the person against whom the seminarian has made his complaint. The third step in the process is a hearing conducted by the Grievance Board. The hearing will consist of a meeting with the aggrieved seminarian and with the person or persons alleged to have committed the grievance. The Grievance Officer presides over the hearing, facilitates the process, and writes the final report. Within one month after the Rector has appointed the board, the Grievance Officer will convene a hearing. The board shall then evaluate the evidence, make findings, and deliver its recommendations to the rector. The fourth step in the process is the disposition by the Rector of the grievance. Within ten working days after the Grievance officer has filed a report, the Rector will deliver a written decision to the parties involved with a copy to the Grievance Officer. The decision of the Rector is final and terminates the Grievance Process. The process will respect the right to privacy and good reputation of all parties involved.